If you have a flight scheduled out of Toronto Pearson Airport tomorrow, you might want to check departures before you head out. And since it’s that bad, Pearson has also sent out a warning to travellers through one of Canada’s busiest airports. “Tomorrow, significant snow/freezing rain is expected, impacting southern Ontario. Airport operations will be affected, leading to cancellations and delays,” reads a tweet from the airport. Earlier today, Environment Canada issued a winter storm watch, as up to 20 cm of snow was expected. The watch is now a storm warning, as a winter storm with a combination of 15 to 25 cm snow and ice pellets, possible freezing rain, and strong winds are expected Tuesday. 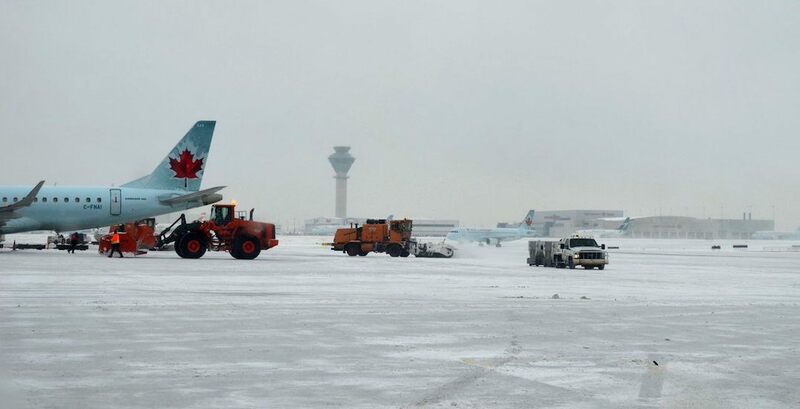 During the freezing rain storm in Toronto last week, around 300 flights were cancelled or delayed at Pearson Airport.